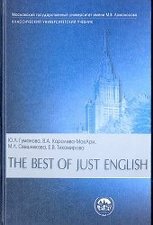 These pages are aimed at a general audience of law students who might find the information on the Just English textbook series interesting and relevant to their studies. Our intention is to make our readers familiar with English teaching at the Law Faculty of Moscow State University, as well as to provide extracts from our books which may be of practical use to students of Law faculties and those hoping to gain admission to them. We have added links to some useful internet sites that could serve as valuable sources of information for students of law. A dictionary of legal terms and some of the authors' personal details can also be found here. And finally, to make it more enjoyable for our readers, we have included a Just for Fun page. We hope you will find the information you are looking for on this site which is continuously updated. Please, feel free to contact us if you wish to make further enquiries.